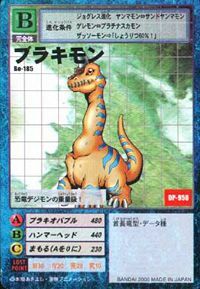 A type of dragon Digimon like Brachiosaurus that existed in ancient times. 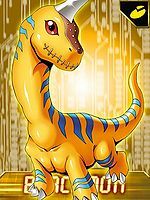 Among the dinosaur Digimon, has a big and heavy body hard to overthrow. However, being herbivorous and quiet, it never attacks unnecessarily. 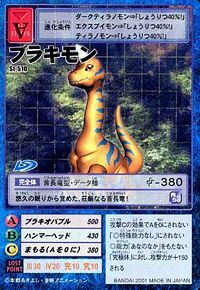 A dragon Digimon like the Brachiosaurus that existed a long time ago. 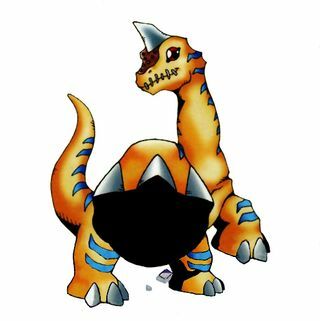 Its quite heavy compared to other dinosaur Digimon, and is difficult to knock down due to its large body. However, by being herbivorous and quiet, never attacks unnecessarily. Its Special Move is "Brachio Bubble", which spits out thousands of bubbles from its mouth to attack the enemy. n., From brachiosaurus ("arm lizard"), a type of sauropod dinosaur that lived during the late Jurassic period. 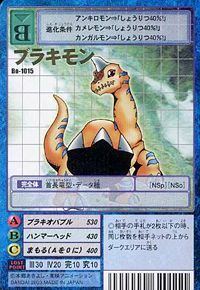 Its name comes from brachion/βραχιων meaning "arm" and sauros/σαυρος meaning "lizard"
Anime/Manga Digimon Savers 3D: The Digital World in Imminent Danger! 3.1.1 Digimon Savers 3D: The Digital World in Imminent Danger! Brachio Bubble  ブラキオバブル Burakio Baburu Breathes a stream of bubbles at the opponent. Hammer Head  ハンマーヘッド Hanmaa Heddo Stabs the opponent with the horn on its head. Aqua Shatter  アクアシャッター Akua Shattā Slams the ground with its forefeet, causing a wave of ice and water to erupt towards the enemy. 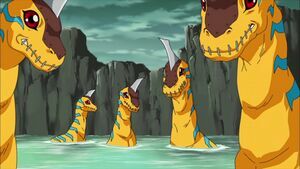 A group of Brachimon from Digimon Xros Wars. A group of Brachimon protect the Waterfall in Dragon's Land. Brachiomon appears as an unobtainable Digimon in Digimon World. Brachiomon makes a very brief appearance in the game, where its amongst one of the residents of the Ancient Dino Region, explaining the Player how time passes in the Glacial Time Zone where time passes slowly and in the Speedy Time Zone where time passes fast. Brachimon is the holder of the Ground 7s Card. It's an impressive long-necked dinosaur who awoke from a perpetual slumber! ↑ Digimon Xros Wars: "Stand Up, Kihira! The Xros Heart Rescue Strategy"
This page was last modified on 2 March 2019, at 21:30.